The journey to machine launch was an arduous one, requiring shipment of TBM components and vehicle transport on unpaved, mountainous roads. 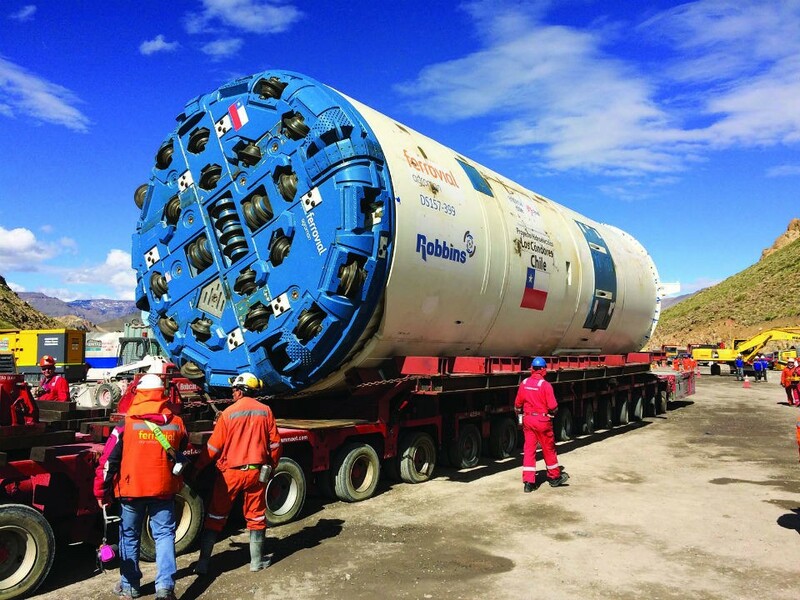 Contractor Ferrovial Agroman is responsible for the intake tunnel at the Los Condores Hydroelectric Project, and was well aware of the challenges associated with machine launch: “The location of the work is a big constraint due to its rugged terrain and geographical location in the Andes. With all this, we are anxious to perform work in an efficient manner,” said Pello Idigoras, Tunnel Production Manager for Ferrovial Agroman. The jobsite, located 360 km (224 mi) south of Santiago, Chile, is part of a new 150 MW power plant and intake tunnel. The Robbins Double Shield TBM is boring two sections of the intake tunnel, the first measuring 6 km (3.7 mi) and the second measuring 4.4 km (2.7 mi). A section between the two tunnels will be excavated by drill and blast to connect them, making the intake tunnel about 12 km (7.5 mi) in length. “This project brings an increase in energy production in the country, thus contributing to the overall improvement in the welfare of its citizens,” said Idigoras of the effect the completed hydropower project will have on surrounding areas. The tunnel, located in the mountainous Maule Region of Chile, is being bored in two types of rock: sedimentary and volcanic. The rock has been tested at strengths up to 100 MPa (14,500 psi) UCS, with at least two fault zones—the first of which has already been traversed in rhyolite, andesite, tuff, and breccia. For Idigoras, the conditions are well-suited to Double Shield tunneling: “We have good quality medium to hard rock for Double Shield excavation overall,” he said. Despite that, some areas of challenging ground persist. To cope with the conditions, including steadily increasing water inflows at rates of up to 3,500 l/min (925 gal/min), the contractor is utilizing cementitious grouting and chemical grouting with polyurethane and foam. Such ground conditioning techniques were anticipated and the Robbins Double shield was designed to effectively apply these techniques.